Cryptocurrency and videogames have been intersecting throughout the past several months, with processing hungry miners scooping up GPUs by the truckload. The result is that PC gamers have found it far more difficult to keep playing, but a new venture aims to combine crypto and gaming in a friendlier way. 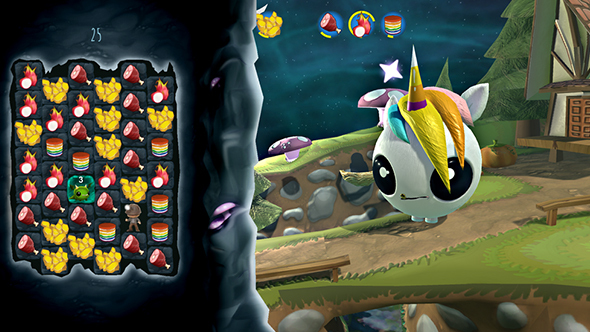 AllMine is a cutesy puzzler where you build a Utopia filled with big-eyed creatures while matching blocks to progress. You collect eggs to hatch new “Adoraboos” that rely on you for food and entertainment. The difference between this and the match-three puzzler of your choice, of course, is that it’s powered by cryptocurrency. MyDream Interactive have launched a currency called Jewelz, built on a lightweight platform intended for individual users, with promises that miners will be limited to a single account. The mining algorithm is supposed to be efficient enough to leave running without it interfering with browsing the web or – naturally – playing games. For its part, AllMine is a free-to-play title that runs alongside the Jewelz miner, and lets you use the currency on in-game boosts and items. Or you can cash out what you’ve earned into other currencies. “We decided to create Jewelz to enable anyone, regardless of their access to computation power, to participate in cryptocurrency mining. With the goal of democratizing cryptocurrency mining, we are building a stable foundation for the Jewelz cryptocurrency through gamification,” says MyDream CEO Allison Huynh. Both the Jewelz currency and AllMine are scheduled to launch on PC in Q3 2018, with “other platforms” to follow later in the year.